Very professional service.Derek drew up our plans in record time,made changes speedily without any quibble Very good price too ! !Friendly & efficient and all my emails were answered extremely promptly. 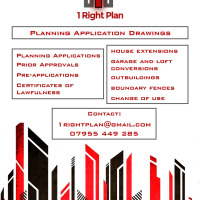 I would highly recommend this firm. Keep it up. Very positive, would highly recommend. Dariusz provided an efficient and cost effective service. Initial site visit was free. Helped with plans for the extension and refurbishment of Victorian property to obtain a certificate of lawfulness. He was honest and approachable. Many thanks Dariusz for your help and advice. 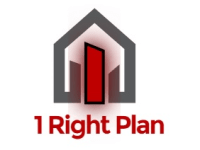 I had a great experience with 1 Right Plan from the beginning! I found the company online and I thought I will give it a chance. Darius has been so helpful, made drawings, professionally dealt with all my expectations. I would highly recommend 1 Right Plan to anyone! Great experience all the way through! I needed simple plans for my sun room extension ASAP. Derek did his job super-efficiently (plans ready in less than a week) and at low cost. Well done. Great service, high quality work for really good price!! Highly recommended! !